-- “Light of the world,” Jesus? -- That’s what I said. 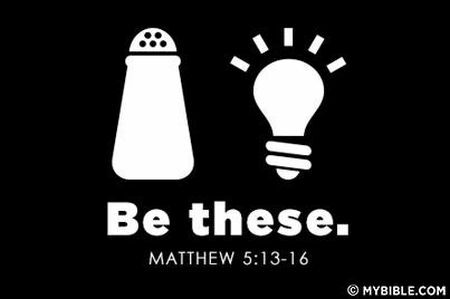 -- And salt of the earth? -- Yeah, I did, but I think I heard somewhere that YOU were “The Light of the World.” Like in all capital letters. -- So, what’s the story? -- Did you read the first reading for today’s mass? -- Did you see how the Prophet Isaiah laid out a whole program for Israel on behalf of the LORD? -- Well, uh – ok, busted! I wasn’t paying a lot of attention, I admit it. -- So? What’s the connection between ancient Israel’s behavior and me being the “light of the world”? -- That’s nice, but I’m still waiting to understand the connection between all that and me. “Here I am!” The Lord says, “I am with you.” Who does that make you think of? -- Jesus, remember when I kind of failed catechism class? Maybe you better keep talking. -- No, Jesus, I don’t get it. Just tell me in plain English how I can possibly be the light of the world…and also what the connection is between me and all of what Isaiah preached to ancient Israel. -- Hmmm. You know, I used to have the same problem with Peter and the others back in the day. All right, ready? Here goes: the connection is – me. Jesus the Christ. When I say that you are the light of the world, I mean that as a member of my Body, you share in my vocation as Emmanuel, you know, “God with us.” I mean that you’re called to give light to the world. That’s L-I-G-H-T in plain English. -- Are you being sarcastic? What are you saying? -- Not sarcastic, just straightforward. Look, you’re baptized, right? -- That makes you part of the Body of Christ -- my Body. That’s not just a metaphor; it’s a reality. As part of me, you’re called to be doing the same things that Isaiah spoke of to Israel, things that I did during my public ministry. Those actions are part of who and what I am. Light happens when they are done, whether by me during my life as a preacher and healer in the first century or by you, in your life as one of my members in the 21st century. As Isaiah said, long ago: Light rises in the gloom – of which, I might add, there’s still too much in the world. Get it now? -- OMG, Jesus, now I’m afraid to ask you about “salt of the earth”! -- No, seriously, I do get it. I’m part of you, called to take part in you and with you during this life of mine. I’m not off the hook just because I can say “Jesus is the Light of the World.” If anything, that fact reinforces my call to be light myself. You’re right about too much gloom, too: there’s a lot of darkness out there. Listening to Isaiah – and you too, of course – shows me how to be light. And I’ve got to be light in order to give light. -- Hey, I’m impressed -- now you’re quoting my friend Marie Eugénie! Looks like you’ve got the makings of a disciple after all. -- Yeah, just like Peter and the guys: a little slow on the uptake, but once I get it, I got it. Thanks, Jesus.